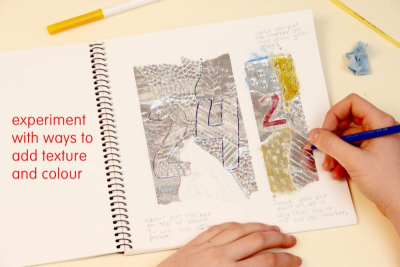 Students experiment with aluminum foil tape, markers and acrylic paint to create a variety of textures, patterns and colour effects. Tear or cut pieces of aluminum foil tape and press them onto the paper. Use your fingers or a piece of paper to flatten and smooth the tape. Use 3 or 4 pieces of tape. Place a soft paper towel or piece of felt under the paper. 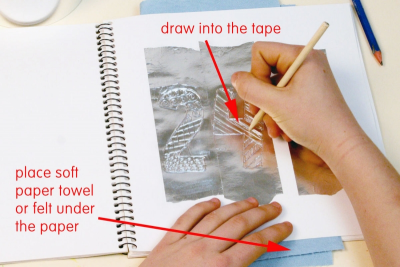 Draw into the foil tape using a dull pencil or a candy apple stick. Experiment with ways to add patterns, textures and colour effects. Compare your ideas with those of your classmates. Think of how you might use these techniques in an artwork. share their ideas with peers. 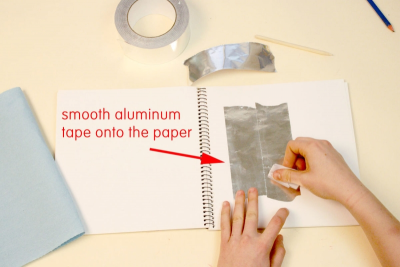 ​Prepare a piece of paper with aluminum foil tape on it for demonstration purposes. Download and display the Texture and Repetition posters available on this website. Teach or review concepts about texture and pattern. View an image of tooled leather and ask students how they think it was made. Share information about the process. 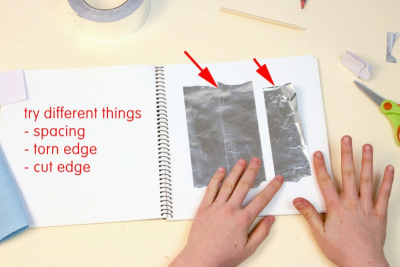 Show students the aluminum foil tape and how to smooth it onto a piece of paper. Explain that the aluminum foil tape can be used to get a similar effect as the tooled leather. Demonstrate how to make marks in the foil using a dull pencil and/or a wooden candy apple stick. View the Texture poster and discuss the difference between real and simulated textures. View the Repetition poster and discuss how to make a pattern. Share your ideas with peers. - talk about what was difficult and what was easy for them. Observe students as they discuss the artworks – active listening, insightful contributions, supporting ideas with evidence found in the artwork and from personal experience.